In feudal Japan, the Edo period brought a time of delicate peace bought with blood. 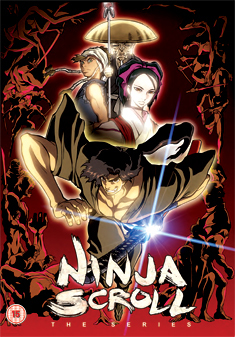 Ninja Scroll: The Series chronicles the life of Jubei Kibagami as he wanders the countryside as a ninja for hire. At this time, ninja clans are everywhere. One clan, known as the Hiruko Clan, doomed to live and die in darkness, protects a sacred treasure called the Dragon Stone and the treasure it hides. Jubei is the best man for the job of protecting both the Dragon Stone and the only one who can use it - The Light Maiden. Contains Vol.1-3, the complete anime series.